The new “Inadmissibility on Public Charge Grounds Rule” proposed by the Department of Homeland Security poses a threat to the health of our community and our nation. USCIS is taking public comments through December 10, 2018. HealthierHere has prepared a tool kit to support our Innovation Partners in learning about and commenting on this critical issue. Click the title to learn more and download the tool kit materials. We’ve added 4 additional opportunities for community-based and social services organizations to learn about our work and how they can get involved. Participation in an information session is required as a first step toward Community Partnership with HealthierHere, and this is the last series of sessions offered during the initial planning and engagement phase of our work. The Community and Tribal Engagement Manager (Tribal Health Focus) will support the strategic coordination of HealthierHere’s community and tribal engagement activities with an emphasis on incorporating the voice of American Indians and Alaska Natives, in HealthierHere’s efforts, building partnerships with and supporting clinical and community health providers to improve health outcomes for this specific population of community members, and authentically engaging with American Indians, Alaska Natives, tribal members and Urban Indians to identify health priorities and strategies to improve health outcomes and reduce health disparities. Applications are due by November 9, 2018. Read on for more info and how to apply. HealthierHere recently disbursed $3.6 million to over 50 local Medicaid provider organizations for their participation in 2018 partner engagement and planning activities. Working closely with a broad spectrum of organizations from all sectors is part of what makes this work so unique, and – we anticipate – so impactful. You’ve come to the right place. HealthierHere is seeking community partners! Read on to learn about and register for the important first step to becoming a HealthierHere community partner. Where do community members and community-based groups fit into HealthierHere’s work and vision? Marya Gingrey, HealthierHere’s Director of Equity and Community Engagement, recently had the pleasure of joining our local Somali Health Board’s Quarterly Meeting to discuss this topic. Watch the video to learn more. HealthierHere is proud to serve as King County’s Accountable Community of Health, and we encourage providers and organizations from all sectors and specialties to engage with our work to improve health in our community. The Washington Academy of Family Physicians (WAFP) Foundation recently announced a new opportunity for family physicians wanting to participate in this important work. The Community and Consumer Voice (CCV) Committee of HealthierHere is seeking proposals from community-based groups and organizations to conduct education within community about King County’s Medicaid Transformation Work. Click to learn more about the program and how to apply. Join us in Tukwila August 21! HealthierHere will be joining Healthier Washington’s public forum event in Tukwila on Tuesday, August 21st. We’d love for you to participate! Stay tuned for a list of HealthierHere’s official Practice and Innovation Partners! 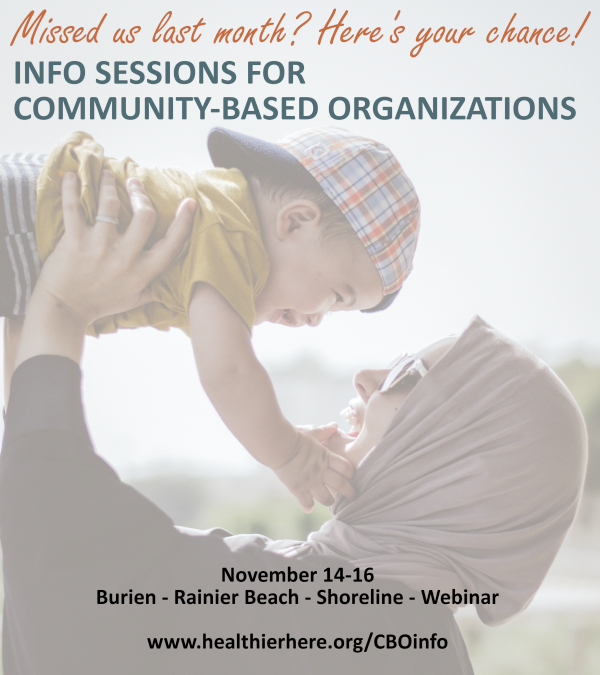 Looking for the November CBO Info Session Webinar? You can watch it here.